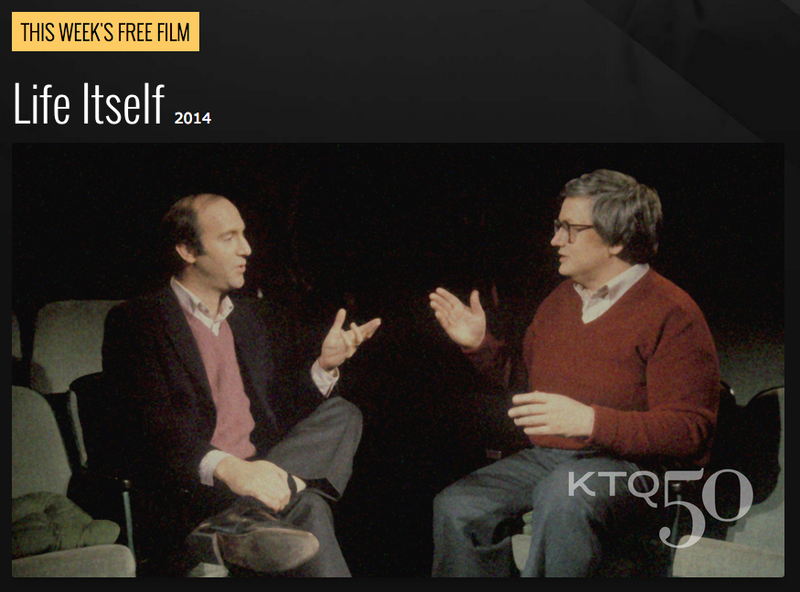 From today until Friday, October 7th, the free KTQ50 film is Life Itself (2014). Watch it now. "A life spent at the movies gets the cinematic epitaph it richly deserves in Life Itself, documentarian Steve James’ meticulous and intensely emotional portrait of the late Roger Ebert." Based on his memoir of the same name, Life Itself recounts the surprising and entertaining life of world-renowned film critic and social commentator Roger Ebert – a story that’s by turns personal, wistful, funny, painful, and transcendent. The film travels through Roger’s life, detailing his precocious start in Urbana, Illinois; his migration to Chicago to start a career at the Chicago Sun Times; his unexpected promotion to movie critic; the creation of the television show that would revolutionize film criticism; and his difficult and inspiring fight with cancer. Life Itself portrays the real man himself and the rich, complicated, and ultimately inspiring life he led. Kartemquin Films was honored to be able to tell Roger Ebert's story, not just as a character or a critic but as a friend with roots as deep as ours. In his first year as a film critic in 1967, he reviewed our very first film, Home for Life. In 1994, he and Gene Siskel became early impassioned, vocal supporters for our film Hoop Dreams in such an unprecedented way that it not only changed Kartemquin, but forever altered public perception of the potential for documentary film. We were honored when he agreed to trust us to create a documentary based on his memoir, Life Itself. Though Ebert was not able to see the final product, director Steve James says he was in his thoughts while finishing the film. "When I was making this film, I kept thinking of him on my shoulder. I'd think what would he want a film about a guy like him to have in it? He wouldn't want it to be painting him as Saint Roger. He wouldn't want it to be hagiography. He'd want some of the messiness of his life in there, because that was what would appeal to him as a critic." Life Itself recently won a Best Editing award at the 2016 Emmys. It has won numerous Best Documentary awards from a variety of festivals and organizations, including Best Documentary Feature from the Critics' Choice Awards, Best Documentary Feature from the National Board of Review, and the Golden Tomato "Best Reviewed Documentary of the Year" from Rotten Tomatoes. It premiered at Sundance in 2014. The soundtrack for Life Itself, composed by Joshua Abrams, is available digitally here. "In a lifetime at the movies, Roger Ebert consumed a lot of empathy, so there’s something almost luminous about seeing him take that empathy and shine it back on himself." Life Itself is available for purchase on DVD here and on Blu Ray here.